Let's enjoy some spicy stew today, shall we? This is a favorite winter time mug that I bought at Kroger several years ago, along with the matching plates. This is a quick recipe that I clipped from the newspaper, and was submitted by Melissa D'Arabian, and adapted by me. It looks like a long list of ingredients, but it's ready to eat in no time. In a large heavy pot over medium-high heat, heat the oil. Add the onion, celery, and carrots and cook about five minutes, until they start getting tender. Add the garlic and chipotles, then stir for about 1 minute. Add the stock, water, beans, corn, and chicken and bring to a simmer. Add the water/cornstarch slurry and stir. Reduce the heat to medium-low and simmer for 10 minutes. Stir in the lime juice and season with salt and pepper, if needed. Ladle into serving bowls, and garnish with avocado, chopped cilantro, shredded cheese, and lime wedges. NOTE: Leftover chipotles can be spooned out onto a waxed paper lined cookie sheet, in individual clumps, with a little sauce, and then frozen. When frozen, store the chipotles in freezer proof bags. Use when needed, when a little heat is desired. Looks delicious, Kitty. Oh if only I lived down the road from you, we could eat stew and share a cup of tea in one of your many pretty teacups. Even though the weather is warm here in Florida, I enjoy a meal like this anytime of the year…it sounds good. A cup of this spicy chicken and black bean soup would be perfect for today. Hi Kitty...I guess there's Tea in that mug?!? That would be an interesting addition to Tea, wouldn't it? Had a tea recently at a local hotel and many items were spicy. Thanks for linking to Tuesday Cuppa Tea. This sounds and looks so good, I can't wait to try it. I will also send this to son in Montreal-because I've been sending him warm and cozy soup recipes. Love all the add ins at the end! I don't do spicy, but I think that tray looks very special. Doing better with presentation for myself is rising in priority. Sometimes meals are so lacking in the "special" department that I can't remember if I ate! I'm not really a stew person but your spicy chicken and black bean stew is making my mouth water! Kitty, I love stews this time of year. This sounds filling and nutritious. Pretty presentation. Enjoy your week. Your table wear is perfect for this time of year. Some times those grocery stores have the sweetest dishes. Your meals must always be wonderful, Kitty. Yum, this looks good Kitty. My snowflake teacups and plates were bought at a grocery store too and later they sold mugs to match. Hi Kitty, Oh my your stew looks delicious. I love a winter time meal like this and of course Larry does as well. Love your wintertime mug. How pretty with the plates for winter meals. You can find some wonderful dishware at Kroger!! I'm still out of town but looking forward to getting back in February. Your spicy chicken black bean stew looks amazing! 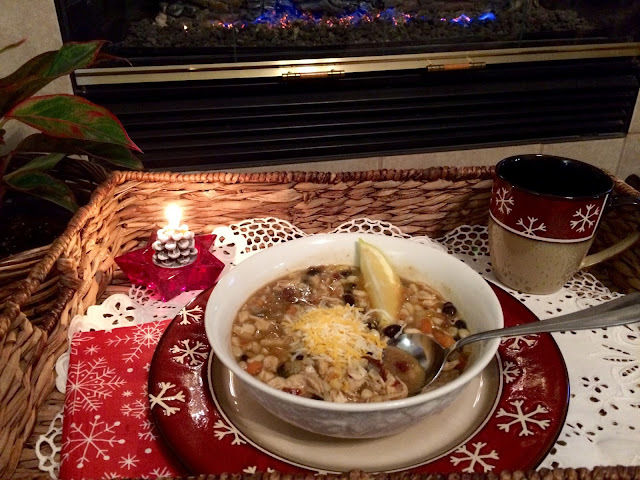 I make something similar, but we call it Chicken Tortilla soup, and throw in sour cream, cheddar cheese, and crushed tortilla chips on top... it is yummy :) Always enjoy your recipes, they are just down-home yummy goodness :) Hugs to you today! Yum!! This looks super delicious! I LOVE these kinds of meals with my favorite spices!! I think I've made chilI 5 times since the first of December. I love it!!! I can't wait to try this! Hope all is well with you Kitty! Oh boy, does that ever look scrumptious, Kitty! We have snow in the forecast for tomorrow, so I'm running out for groceries today. I will add some of these ingredients to my shopping list. 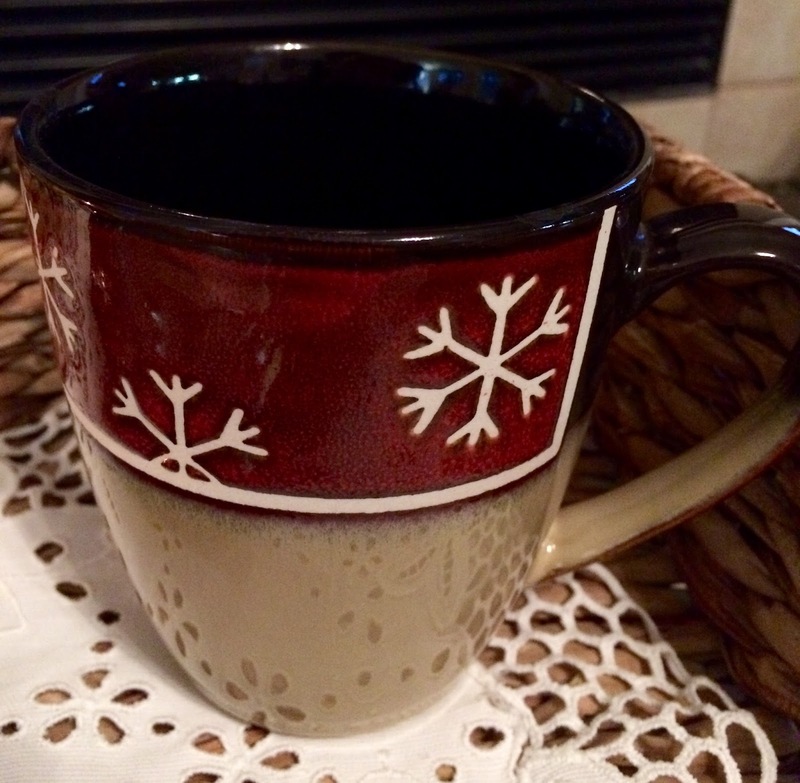 How pretty the eyelet pattern of your basket tray liner picks up the snowflake pattern on your cute cup & plate. Again, very comforting looking. You do a wonderful job of setting up cozy spot! GOod morning, sweetest friend! Oh, this sounds delicious and the perfect dish to make on a cold day...like today :) I was just wondering what I shoud make for supper and I think I found something the three of us would enjoy - thank you, Kitty. Kitty, I would love a bowl of your spicy chicken and black bean stew! Just the right meal to warm you up inside! This looks perfect for a cold day. The spice should really warm things up. We are so cold in Missouri which is ridiculous because it is much warmer here in the winter. We walk around saying "I think I'll put another sweater on". It is the dampness that does it so we need some of your lovely soup! And then have a nice mug of hot cinnamon spice tea! Yum! Thanks for sharing. This dish looks so yummy and comforting Kitty. With the cold weather, it is sure to warm our souls. I hope the new year is bright and promising. Sounds yummy Kitty! Perfect for a cold winter night. Thanks for sharing with SYC. Kitty - this recipe sounds so hearty and healthy and perfect for winter! Thanks for sharing your recipe - yum yum. Kitty, what's not to love about that! Except, for me, the garlic (a most unfortunate allergy to have!). This sounds like something we are going to love. What a great bowl of goodness. 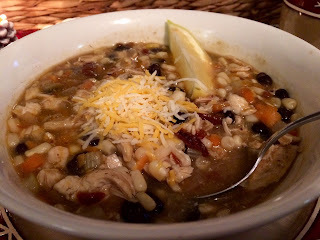 We will love your Spicy Chicken Black Bean Stew! Hope you are enjoying your day and thanks so much for sharing your awesome post with us at Full Plate Thursday! thanks for sharing the recipe, i love chicken.